Melanoma and Skin Cancer Awareness Month is winding down with the end of May and today is the last day of school for my kiddos! This summer break we plan to do lots of swimming, playing soccer in our backyard, and geocaching. It will involve lots of time enjoying the outdoors in our beautiful desert home. When I was first diagnosed with melanoma, I was afraid to be outside in the sun. With time and practice I have learned with a little thought and planning I can enjoy outdoor activities and still protect my skin! This is also the time of year I am purchasing new sunscreens for the summer. Today, the Friday before Memorial Day weekend, is designated as “No Fry Friday.” A good time to do a little sunscreen and a sun safety reminder. So, if you are doing your summer sunscreen purchasing right now like I am, here are a few things to keep in mind as you consider what to buy. UPF clothing and hats as well as sunglasses provide additional and necessary protection when outside! Horray for UPF swimsuits and sunglasses! 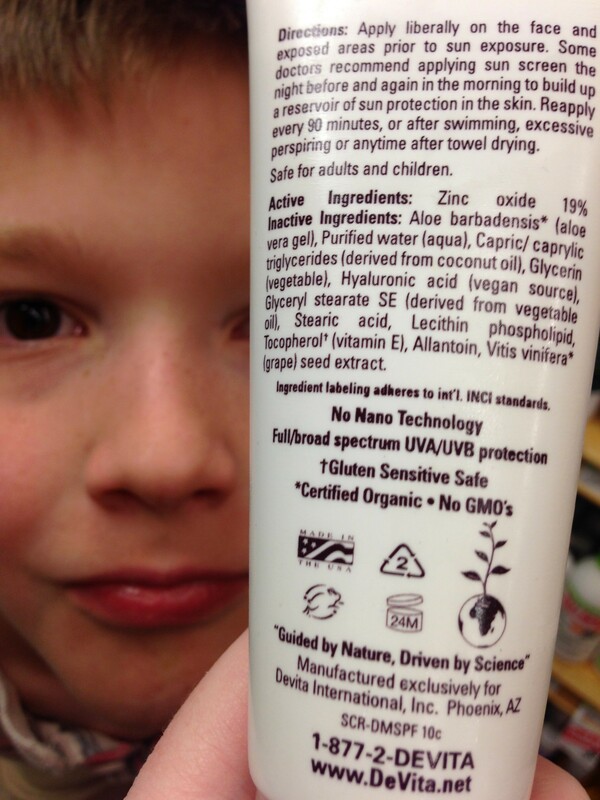 I am often asked my opinions and recommendations on sunscreen products for children and adults. 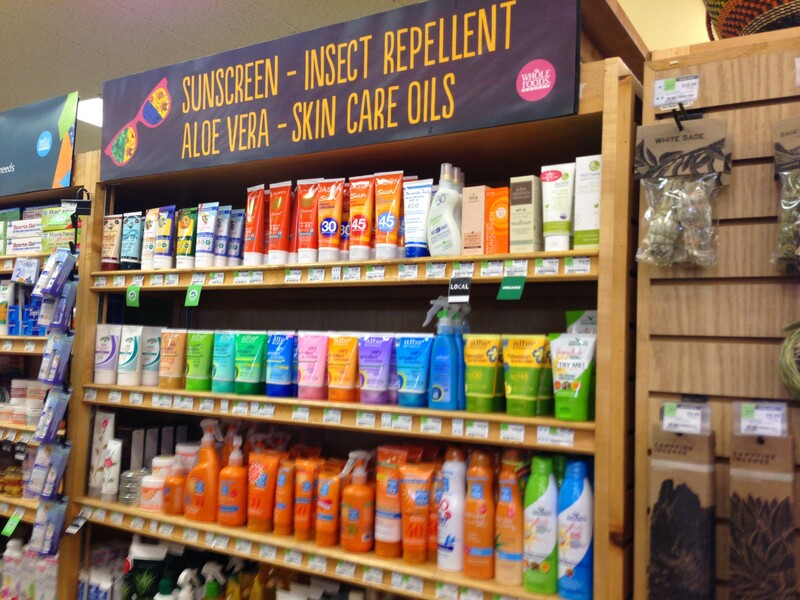 Whole Foods is a good place to locate mineral based sunscreens free of nano particles and potentially dangerous chemicals like oxybenzone. I wrote about my concerns about oxybenzone in my post FAQ2: How to Evaluate a Sunscreen. 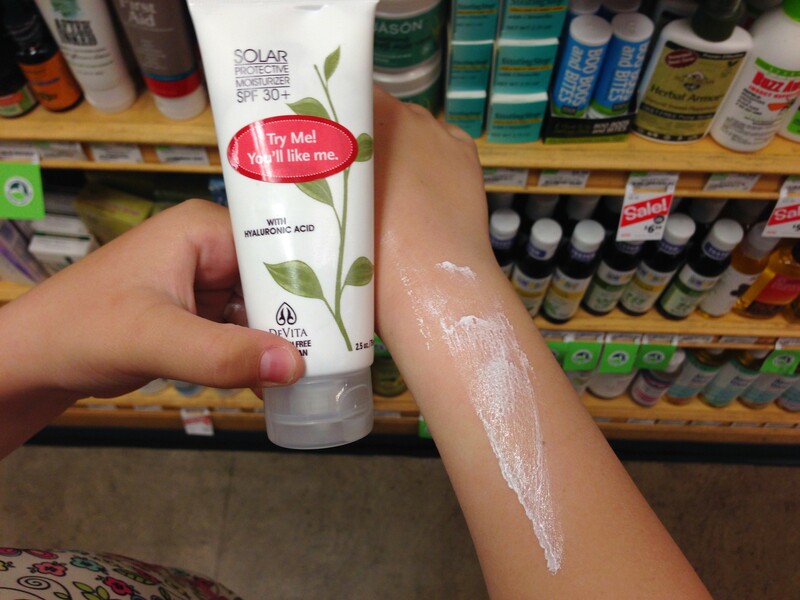 Beginning tomorrow, Whole Foods is offering 30% off Sun Care Products from May 23rd thru 26th. The family and I went to Whole Foods on Speedway to check out their selection for you. DeVita Sunscreen is made locally in Phoenix! 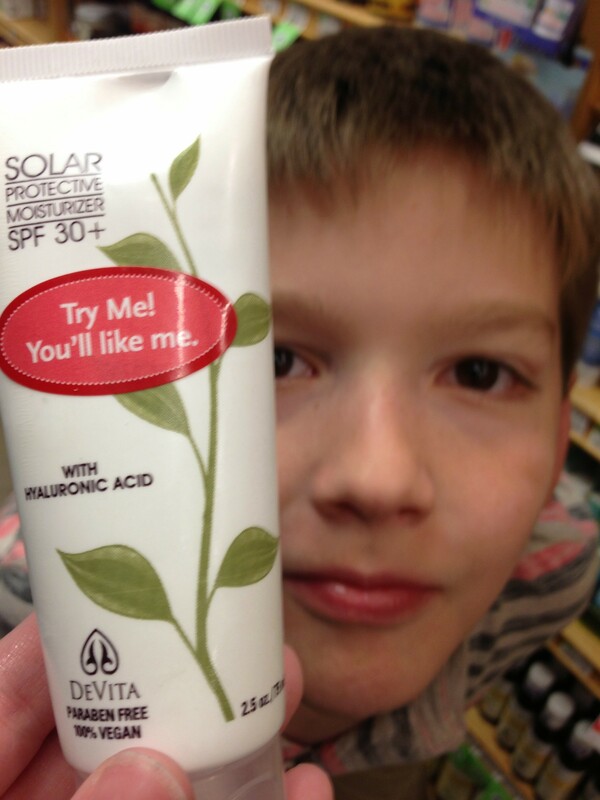 We found a new favorite sunscreen today. DeVita Solar Protective Moisture Sunscreen SPF30 Made in Phoenix, AZ. Short ingredient list. Rubbed in beautifully. All natural. Sold! Abby models the smooth texture of Devita sunscreen. 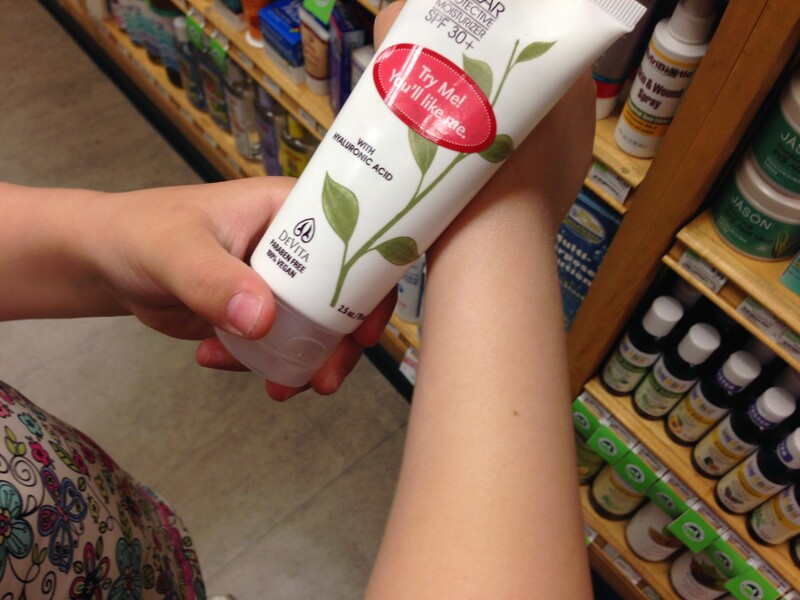 DeVita sunscreen rubbed in quickly with no white residue! For my very local friends, the Whole Foods Market Oracle store remodel is due to finish and reopen at the end of August. Yay! You can follow all Tucson locations on Twitter for updates! Stay tuned for upcoming reviews of other sunscreens we tested out today. We found a few great new brands and one we’d skip! Enjoy your Memorial Day and don’t forget your sunscreen! 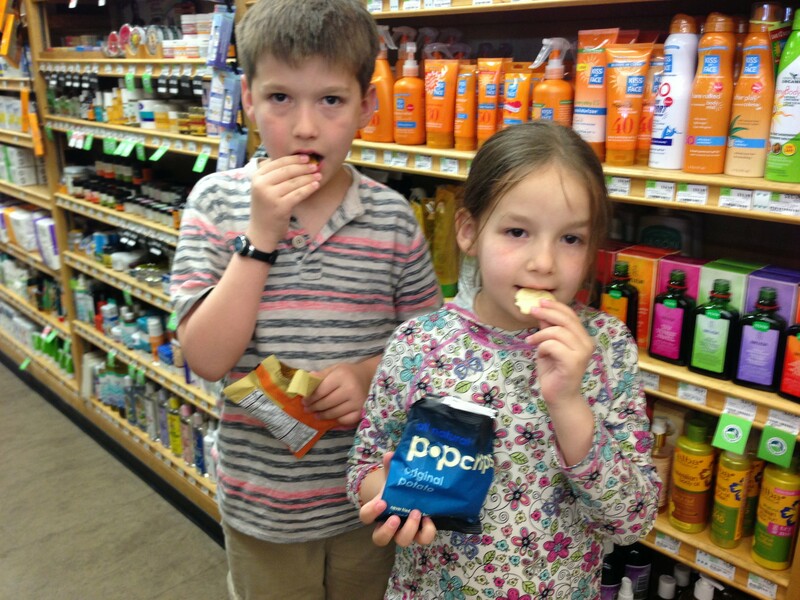 Thanks to Whole Foods for offering my tired children a sample without even knowing I was writing a review! I am currently on a plane heading to Philadelphia for a meeting being sponsored by Glaxosmithkline (GSK) for a group of melanoma bloggers and non profit representatives. We will be comparing notes on what methods of communication are best working for us, what we feel is needed and how GSK can help us spread awareness of melanoma. Also the hope in current treatments and trials as well as prevention. One of the most exciting parts of this trip for me will be meeting some of the people who are in my online support group while we are all in Philly. I am so excited to meet Jen and Steve Martin from A Bump in the Road. Erin from Melanoma and the City will be there. T.J. Sharpe who writes a blog Patient One for Philly.com will be there as well as Rich McDonald from Hotel Melanoma. We have some time planned for sightseeing as well. I am not the only one in our group who hasn’t been to Pennsylvania before. For now, my flight has just left Tucson and is headed to Dallas. I was up too late and too early and am hoping to rest, although my super fancy germ mask (I swear, I should have sharpied “I’m on chemo on it not carrying some dangerous pathogen!”) and being right a super loud row behind the engines in a middle seat may keep me up this leg. Time to read my favorite magazine, Edible Baja Arizona! 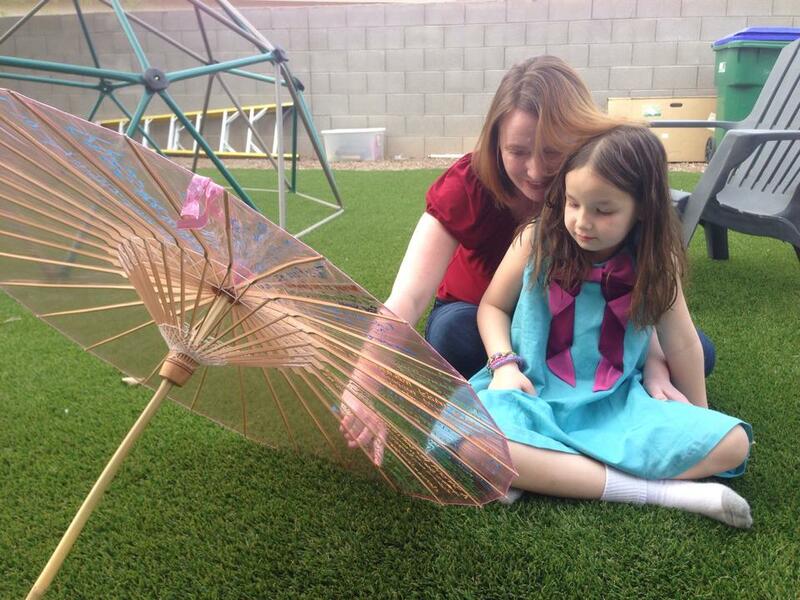 Reading messages from other melanoma warriors during the Pass the Parasol campaign. 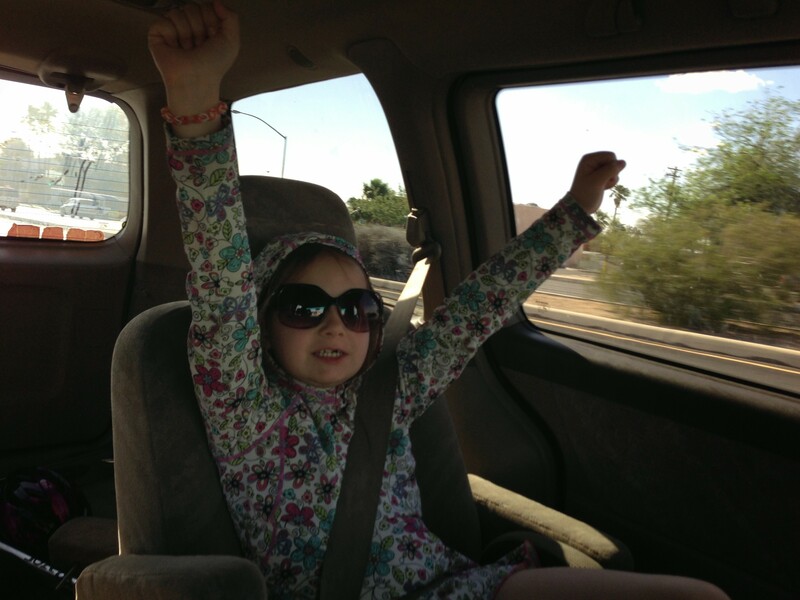 A guest post by my sweet daughter, Abigail Bishop, age 7. I didn’t edit her writing. She refers to “mela-no-mas” because of our melanoma walk team name. We just don’t have the heart to correct her because it’s so stinking cute! I also love that I asked her to tell me “what it’s like when your mom has melanoma.” She came up with the term “my experience” all on her own! My experience with having a mom with mela-no-mas is very scary because i think she will always have mela-no-mas. I really hope my mom stops having skin cancer. My mom has skin cancer because she had a mole that changed on here back. To avoid skin cancer you have to get skin checks once a year and if you see a mole that changed tell your doctor. When Mom has melanoma your friends will come walk with Team Mela-no-mas! I am always sunsafe on safari! 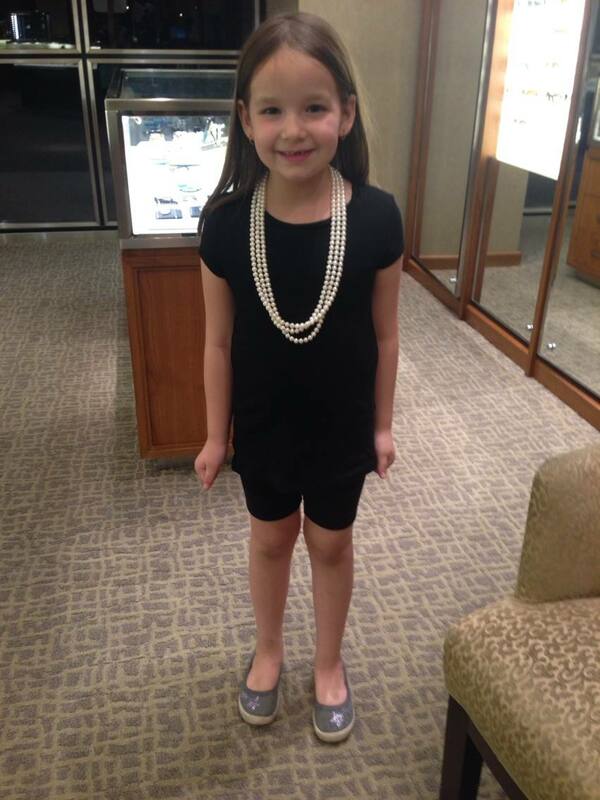 Even if your mom has melanoma, she still might take you on your first trip to Tiffany and Co to try on jewelry! 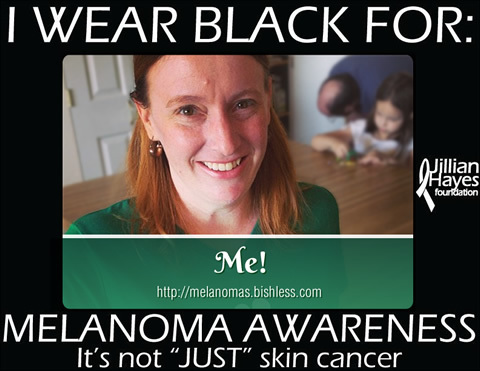 Today is Melanoma Monday, a day to focus on raising awareness of melanoma. My friend and fellow warrior Timna from Respect the Rays made this wonderful awareness video. It’s worth the two minutes and 14 seconds to watch it. Pass it on and make sure you respect the rays! My profile picture on Facebook and Twitter have gone black in honor of my friends who I’ve lost and my fellow warriors. Make sure to keep an eye on sunscreen expiration dates. I found a couple really old bottles last month! A few weeks ago I was at the park with one of my best friends. She pulled out a tube of sunscreen I recognized as a freebie from the Melanoma Walk swag bag a few years ago. Being the bossy/concerned friend I am, I grabbed it, mentioned I’d loved this brand but had she checked the expiration date because they gave it away a few years ago? She insisted it was from this year. I flipped the bottle upside down and it had an expiration date of 2/12. She was shocked and borrowed sunscreen to use that day. I actually went home and found the same bottle in my drawer and tossed it right away! I am preparing to speak to a girl scout troop about sun safety this weekend and pulled out my demo sunscreens from last year. I glanced at the expiration date and found that the sunscreen I bought last May to use in my children’s classrooms expired 3/14! Bah! 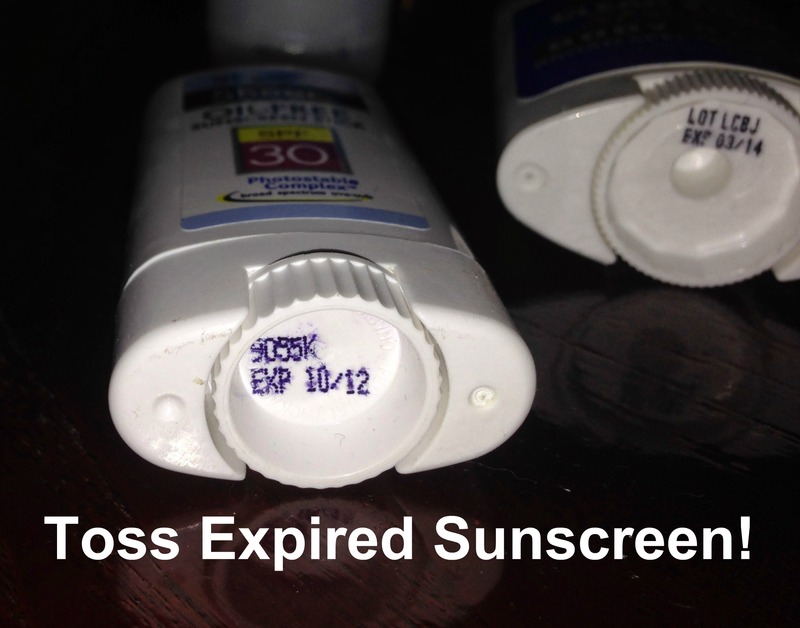 EVERY sunscreen bottle or tube has an expiration date stamped on it. I tend to hoard sunscreen bottles searching for the latest and greatest product and then shove them in my drawer when I don’t absolutely love them. I know this is the time of year people are pulling out the bottles from last summer. Although YOU know you should be wearing sunscreen all winter, right? This is a good time to do a sunscreen inventory and toss that expired sunscreen. PLEASE make sure you check your sunscreen for it’s expiration date. Also, make sure you don’t leave it outside or in your car because the chemicals will break down and cause it to not work as well! It’s not worth risking your skin to bad product! *Edited to add, it’s been confirmed that expired sunscreen was distributed at the Skin Cancer Institute Melanoma Walk this year (November 2013.) PLEASE check all you bottles, including those freebies! I wear black for me! May is melanoma and skin cancer awareness and prevention month. 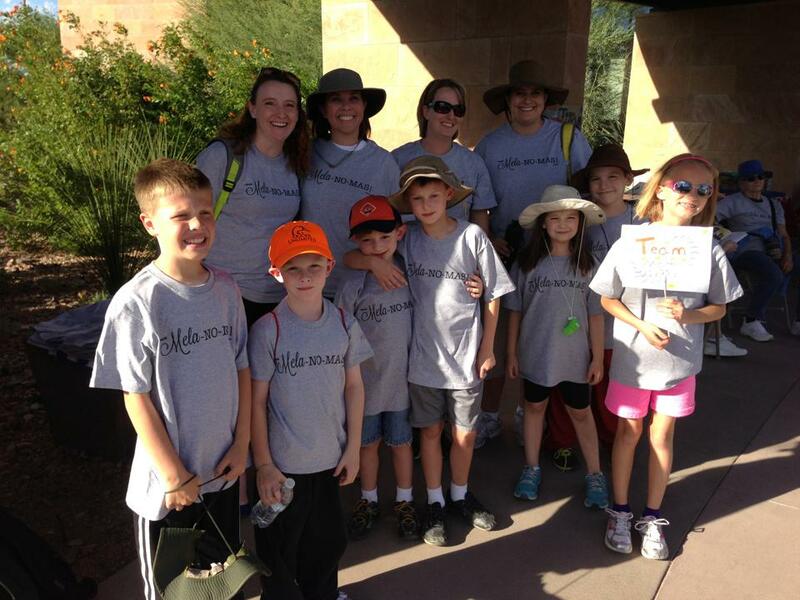 The melanoma community is working to do some wonderful things for education and awareness. Last year I was blessed to have many people honor me by wearing black on melanoma Monday and it felt so good. This November at the annual local melanoma walk I had a large team of family, friends and co-workers supporting Team Mela-NO-mas. I feel like after almost five years of this journey, people are understanding melanoma better. They know it’s not “just” skin cancer. It first invaded a mole, then my lymph nodes, then my lungs and even my brain. At this point, I am healthier than I have been in years and have real hope that I have a long future dealing with melanoma in more of a chronic disease relationship than a fatal disease. BUT that does not mean that I haven’t narrowly avoided a death sentence and may very well end up fighting for my life again. This fight has changed me in ways I never thought it would. I’m not sure if I will ever be able to communicate them. Daniel and I joke that I am “past my expiration date.” And boy am I thankful for that! But this journey has left me restless. I am still frustrated that people close to me don’t “get it.” I see friends who have walked this journey at my side not wear sunscreen or complain to me about tan lines. It’s pretty obvious when I go to the park with them and they put sunscreen on their kids (just because I’m there) none of them are in the habit of applying it daily. Celebrating tans or complaining about tan lines developed on vacation is like rubbing salt in my wounds. And while I try to find peace with their choice, to be honest, it feels belittling to my journey. 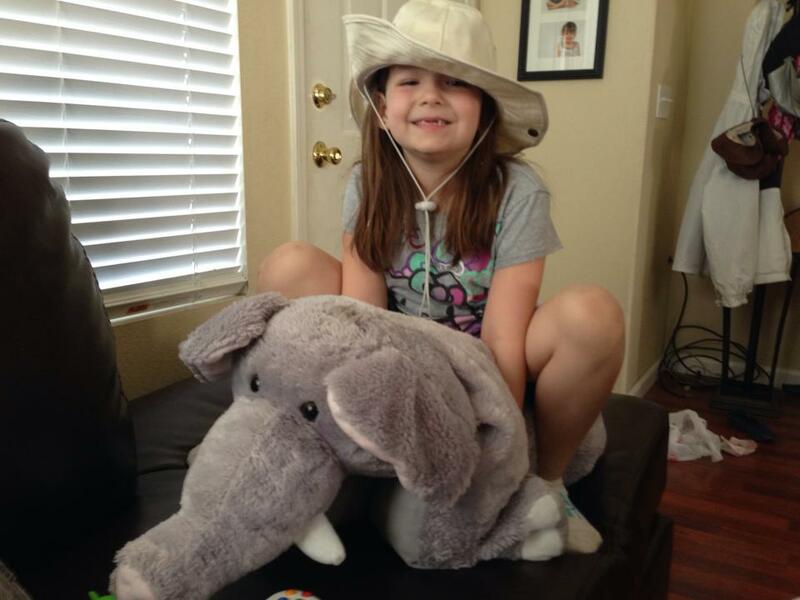 There ARE things they can do to protect themselves and their children from this disease and when they don’t take those steps, it’s tough not to take it personally. For all my frustrations, there are people getting the message. I do have friends who diligently slather sunscreen on their kids and themselves daily. I have friends who have stopped tanning because of my story. I have friends who have had skin checks and avoided a late stage diagnosis like mine. This month there are some wonderful campaigns going on. There are clever slogans and moving videos. I will be sharing many of those. Many of my fellow warriors are sharing their own stories. But this year, I’m not asking you to wear black for me. I’m asking you to learn from my journey to hell and back. Change your habits. Protect yourself from the sun. Check your skin. Check your kids. Make a derm appointment. Work to change your perception of a healthy glow to undamaged and protected skin. Try a new sunscreen to make it easier to wear. Do one thing for YOU and your family. I’ll wear black for me. If you wear black, do it for you, but don’t make that the only thing you do.